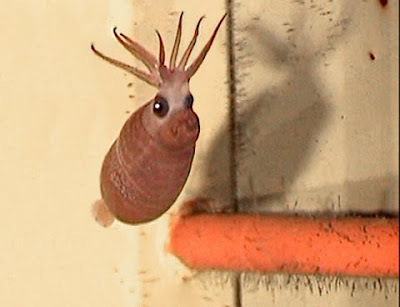 The piglet squid is actually adorable, so it has no right to be here. 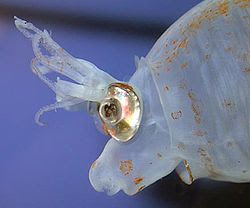 But, it is a mollusk, and mollusks should always feel welcome at Ugly Overload. 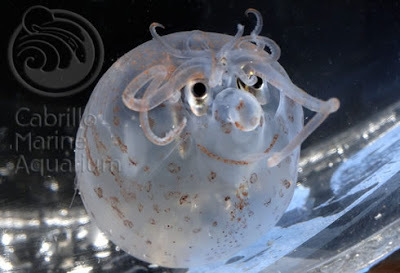 Like so many squids, it's hard for me to find much information on the piglet. They get to be about 10 cm in mantle length (the cylindrical portion of their body), and they sport their legs above their eyes. That's right, they've broken the mold. They don't do the squid thing like anyone else, no, not the piglet. How's that for outside-the-box-thinking? The next time my boss has an all-staff meeting to motivate us and encourage us toward innovation, I'll be sure to mention this guy. Thanks for the new squid, Jelo. looks like he's having a bad hair day. oh my goodness! I actually gave a little giggle when I saw him. How wonderful! HG Wells signed a copy of his book 'The War of the Worlds' and included a drawing of one of his Martians. They look like this little guy! That's a really neat critter! So how about that 3rd one, is it actually smiling? Surely that's not possible?